Today, I’m sharing oven lamb shawerma. You’ve seen shawerma: those standing spicks of layered meat spinning in fast-food joints. Usually shaved into a round pita and rolled up into a sandwich, or poured onto a plate with a side of pickles and vegetables. If you grew up in Syria, you had your favorite neighborhood spot because of the spices he used for his meat or because of his special white sauce. Nothing beats biting into this mouth-watering sandwich, where you get the perfect balance of the spiced meat, crunchy and zesty pickles and the brightness of the yogurt sauce. The bread and folded napkin it’s served in are never enough to keep the grease from dripping down to your elbows, but it’s just so good you don’t even care. I don’t actually come across someone who replicates these flavors outside of the Levant very often. In the US, I ate some great chicken shawerma (here and another place in Bay Ridge, Brooklyn I can’t remember the name! ), but excellent lamb shawerma is really hard to come by. In Dubai, the melting pot doesn’t lend well to this comfort food. Variations involve adding curry spices, grilling the meat, adding french fries and much more. Some may like these modifications, but they just don’t come close to the perfection that is a traditional shawerma sandwich. To be honest, neither does this oven version, but it does come pretty close. I can’t stress the importance of using a fatty cut of meat. Without the fat, your shawerma will be very dry. It helps to have a trusted butcher for this one. Ask him to leave a lot of the fat on and to cut up the meat into fajita or shawerma strips. 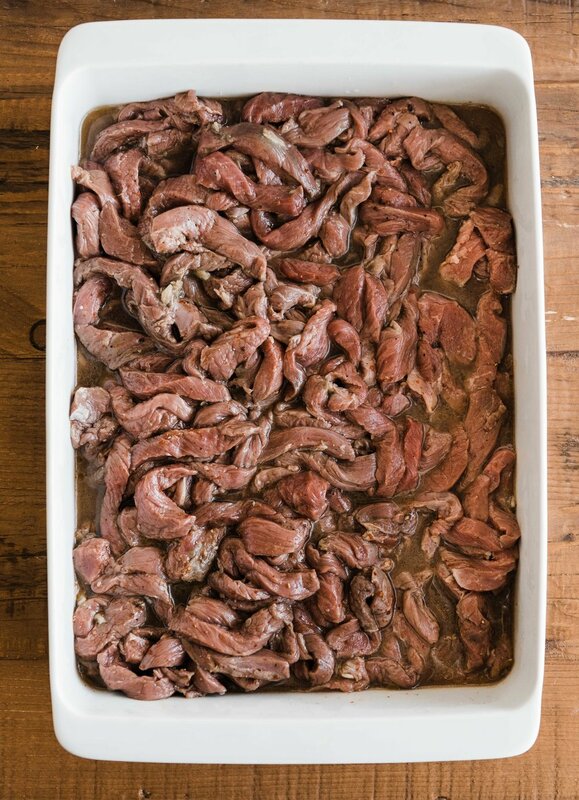 Marinate the meat in a deep roasting pan with apple cider vinegar, garlic, spices and Arabic mastic. The next day, you cover it and let it braise until the fat renders down and the meat is nice and tender. The result? 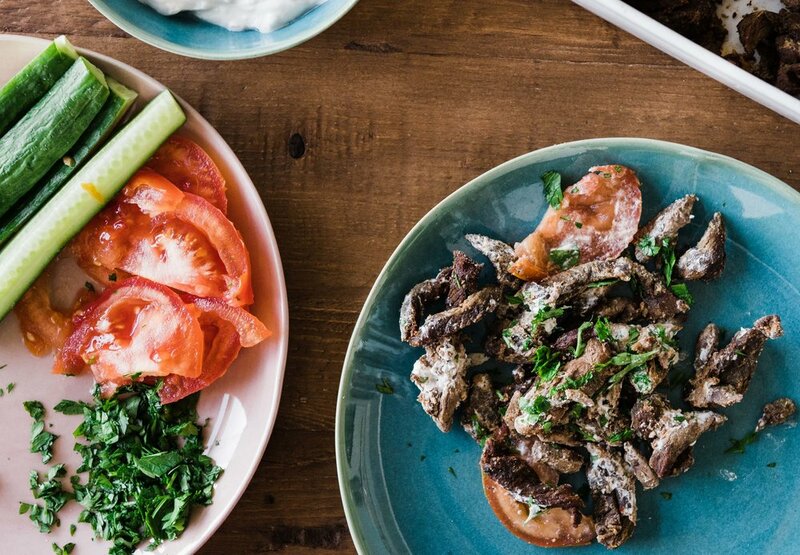 Juicy, delicious meat, almost exactly like you would get on the streets of Syria. I talked about mastic in my series #spicestories yesterday on Instagram. Mastic is heady like licorice but without the bitterness. It’s piney and aromatic, and it also lends a gummy texture, making it perfect for…you guessed it…gum (which you find in the Middle East). Mastic is also often used in sweets, like Syrian ice cream, ma’amoul cookies and in Turkish delight. In this shawerma recipe, it gives it an extra bite that’s just wonderful. You can serve the shawerma with pita bread or wraps for sandwiches or next to hummus and a plate of salad. You can even put these in a bowl for a great work lunch option. I can’t wait for you to try it! If you do try it, don’t forget to comment below or tag me on Instagram at @omayahatassi. I love to see your creations! Mix all the ingredients in a roasting pan. Cover the roasting pan and place in the preheated oven. Braise until nice and tender, about 2 hours-2 hours 30 minutes, stirring once while cooking. Uncover the meat and reduce the braising liquid for about 20-30 mins. While the meat is cooking, make the yogurt sauce by combining the ingredients. Remove the meat from the liquid and serve with yogurt sauce or hummus, pita bread, pickles, tomatoes and cucumbers for sandwiches. You can also serve next to rice or a salad. *Mastic can be found in Middle Eastern grocery stores in crystal form. You can grind it with a mortar and pestle or smash it in a Ziplock bag (opened in a corner) with the back of a pan.